"I didn't like that lady." "The nurse?" I ask. "Which one?" Of course. She was the one who put the stickers on—little white circles with a metal tab in the middle. She was the one who hooked up the wires for the EKG, monitoring the electrical activity and the hole in his heart. Her accent had been thick—making it hard for Rowan to understand her, and I'd forgotten to tell him about the test. We'd been so wrapped up in the echocardiogram earlier in the morning, making sure he remembered to lie down and stay really still. We had to get this one right—we needed to set the date for his surgery. 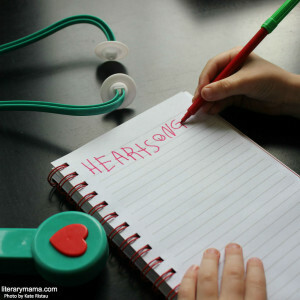 The echocardiogram would show us the hole, and any changes to the size and shape. We'd been hoping that tissue would gather around the hole. We'd been hoping to get lucky, and that the hole would close on its own. We'd been hoping for five years, and his symptoms had only gotten worse. Rowan didn't know any of that. He just thought it was hilarious they were going to put jelly all over his chest, and loved that he got to watch the movie Cars. He had done so well, hand wrapped in mine, eyes flashing between the monitors and the TV. But then the EKG, and those stupid little stickers. I don't think he understood what was going on at first. There were seven stickers, crossing his chest like a constellation, and they stuck. Slowly, she pulled them up, their sticky backs stretching his pale skin upward until they released, snapping his skin, painting it red and raw. She placed each sticker on a waxy sheet. "He did good," she said. "I'll let the doctor know he's ready." She bent down to meet his gaze. "Do you want the stickers?" She held them out to him, and his hand lifted up, then down, unsure if he should touch those talismans of pain. She dropped them into my hand instead and rolled her cart out of the room. He watched her leave, rubbing his chest over the imprints the stickers left on his skin, fingers running back and forth across the new stars covering his body. "Sorry, honey. Did it hurt?" "She didn't want it to." Now, he climbs off the bed, feet dangling for a moment before they hit the floor, then shoves the curtain aside. The light floods in. I hand them over, and he walks to his backpack, digs out a sheet of paper, and immediately starts covering it with those sticky little tabs. I want to grab them back and tear them to shreds. I want to throw them in the trash, drop a match inside, and watch it all burn. It's bad enough being stuck in this little cube of a room, being forced to make these impossible decisions. Why not add in the tear of skin and the bite of a lip? Why not hands squeezing down hard in shock and then pain? I just want this to be over. I want it to be six months from now. I want my son playing with stickers that weren't just ripped off his chest, and I want his heart to be fine. I want him playing in the sun and stomping puddles in the rain. I don't want to think about what's coming next. How Rowan doesn't know what's on the other side of this appointment. How he could never even imagine that his doctor—whom he loves—is going to cut him open, slide in a patch, and sew him back up. He doesn't understand that the stickers are just the beginning, and the constellation of red will turn into a fiery comet, burning right through him, and sliding down his chest. He will lie in that hospital bed for weeks, and then we'll take him home. We'll clean his chest and watch for infection in his tiny body, wondering at every fever, ever rash, every cough. Summer will slip away, and he'll be stuck on the couch, wishing he were outside. "Look," he says. He holds out the paper, now covered in stickers. "Connect the dots." My own eyes fall back down to his chest and the red blotches marking his skin. Not even a freckle to interrupt the cascade of red stars. He's only five. He's so small. So little. So breakable, but he doesn't know that yet. I smile. I can do this. I will. We're more than this room. We're more than this hospital. And we're more than those stickers. I take his pen, click the top, and I draw a new constellation. Wow, tears from me. I have a sick kid, too. I've been in those cube rooms. :( Yes, we have the promise of new constellations, but they're hard to see them when the currents ones are so darn bright. Love you Kate, and Rowan. You are so strong, I know you will get through this. You guys are amazing! Hugs for you and tears from me. I have a friend with a little just born and they're watching the hole in heart as well.